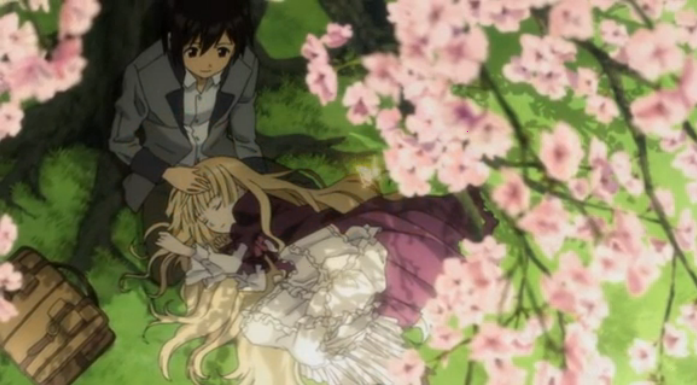 We are now into this series’ second course, so I wanted to make a quick post on Gosick episode 14, or rather how things are developing in general, and link you up with the OP and both EDs. A scene from the OP to which I hadn't paid enough attention. 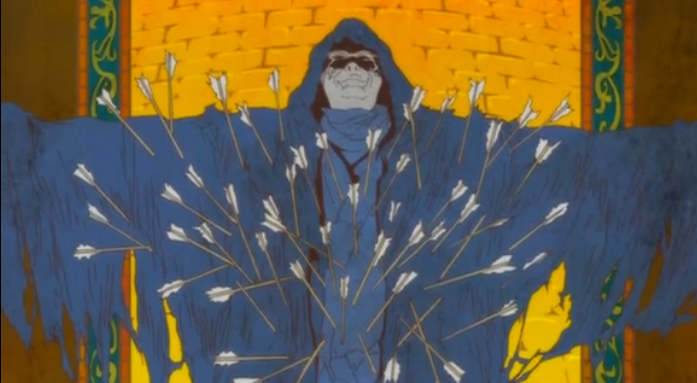 This arc is actually making use of some of the imagery from the OP that I had thought was just decorative or fanciful, including the above illustration of a mysterious figure shot full of arrows. It also is making fuller use of several of the side characters, so it has the feeling of a more important part of Kujo and Victorica’s story. The better use of the side characters also really helps to make the world the protagonists live in seem more believable. It still has a somewhat contrived feel, because each arc has a very obvious (and extremely convenient) set up, in which important hints and red herrings are introduced that pertain to the mystery at hand. I don’t mind the formulaic set up, though, because it helps to give the series its rhythm. One of the things that I do really enjoy about this series is the OP, Destin Histoire by yoshiki*lisa. It’s a nice pop number. I wrote before of the referencing of Art Nouveau style in it, but never linked to the video itself, so here it is. (By the way, the official music video is basically an extended photo shoot of the (admittedly beautiful) vocalist, and thus undercuts the energy that is so apparent when watching the animated version. The first ED, Resuscitated Hope by Lisa Komine, was also very enjoyable musically, although it wasn’t nearly as interesting visually. Lisa Komine also performs the ED, Unity, that started with episode 13. Musically, I’m not as impressed, although it is visually much more ambitious. It includes some interesting footage meant to depict Victorica’s time growing up imprisoned. In my opinion, the only reason this arc has gotten interesting was because of the appearance of Bryan Roscoe. I think he’s a very mysterious man, can’t wait to find out who he actually is. This arc was rather interesting I think. At least better than the previous ones. The first 12 episodes seem to have mostly been setup for what is going on now (or is just beginning), while giving Victorica and Kujo time to grow close. Bryan Roscoe, to me, represents the bigger issues that I sense the show will start delving into. Of course, I don’t know. This is just me guessing.